Data continues to grow explosively, and rapid development of mobile applications and cloud computing is expected to give an even greater impetus for future growth. Simply installing a new server to fulfill each request leads to server sprawl, with increased costs and unrelenting complexity that further slows IT's ability to respond to business demands. Virtualization promises some relief through server consolidation, but that too can increase network sprawl at the server edge and result in memory and I/O bottlenecks. 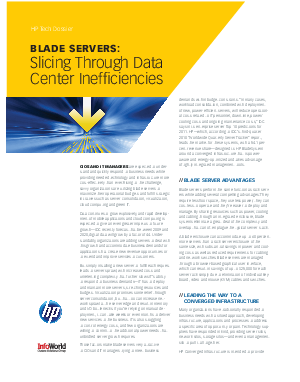 Download this white paper to find out why CIOs and IT managers are discovering blade servers to be the ultimate solution for workload consolidation, while reducing operational costs and maintaining uptime in an energy-efficient manner.